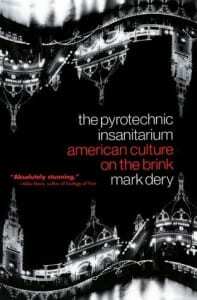 Buy The Pyrotechnic Insanitarium now. A January 11, 1999 New York magazine review. A February 18, 1999 review in Salon magazine, by David Hudson. A review from the February 25, 1999 San Jose Metro, by Richard von Busack. A March 31, 1999 review from the San Francisco Bay Guardian. A June 1, 1999 review from Arena magazine. An April 1, 1999 review from the Seattle Weekly. An April 5, 1999 review from the Boston Phoenix. An April 22, 1999 Atlantic Monthly review. A May 9, 1999 review on the cybercrit mailing list, Nettime, by the Australian cultural critic McKenzie Wark. A July, 2000 review from Science Fiction Studies.